The On the Run guy aka Mahmoud Soliman is back with vengeance. On Sunday, the man who became famous for being filmed while sexually harassing a young lady in New Cairo from two weeks ago is going to sue that girl, Menna Gobran for defame !!! I can’t even believe that he has got the nerve to do that. Lawyer Tarek Gamil Saeed who represents Soliman made rounds in the country’s most popular talk shows declaring that he would report Gobran to the Prosecutor general soon. Tarek Saeed who made headlines last week with his beach wedding to socialite Menna Hussein Fahmy “Nobody spoke about her Wedding Tankini dress” dared and questioned what Menna Goubran in clear double standards. I am angry and furious. Anyhow just as I am wondering what Goubran will do, it seems that the girl who avoided publicity as much as she can “unlike Soliman” got to herself the most unexpected strongest ally in her back at the perfect time. Yes, the World’s biggest Islamic Institution AL-AZHAR declared its support to sexual harassments victims like Menna in the most powerful and unexpected way. The Conservative Al-Azhar said on Monday that “SEXUAL HARASSMENT WHETHER A SIGN OR VERBAL OR PHYSICAL IS PROHIBITED IN ISLAM” describing it as “perverted action”. Al-Azhar also slammed those who blame the victims of sexual harassment for what they wear using religion to justify that sort of blame. Al-Azhar also called the state to enforce the counter-sexual harassment laws in the country. Its statement also spoke about the sexual harassments of children for the first time. It also called on the media to avoid publishing any material supporting or encouraging sexual harassment. I am proud that Al-Azhar took that stand. I do not want to hear anyone after that statement saying that sexual harassment because girls and women wearing provoking clothes that are against Islam. This statement does not help Menna if she stands in the court but it helps and will help other victims. Al-Azhar published statement after a week full of the Eid sexual harassment horrifying incidents, above them the murder of a man in an Alexandria beach trying to defend his wife against a thug who was armed with a machete. The statement of the most important religious institution is so important and I hope it will help in countering that ugly sexual harassment craze in Egypt. 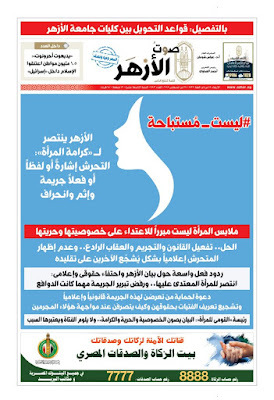 Here is the new issue of Al-Azhar weekly newspaper with a front page of a woman's silhouette speaking about Al-Azhar's unprecedented statement. FYI, this statement is creating anger among the Ultra-conservative brach in Al-Azhar. It is worth to mention according to a UN’s study about sexual harassment in 2013 in Egypt, 99.3% of the women interviewed in the study said that they were sexually harassed whereas 59.9% said that they were physically harassed by touch. It happens because of the culture of victim blaming. It happens when people turn a blind eye. It happens because the perpetrators get away with it.